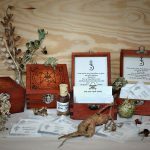 About the boxes: they contain seeds from at least 44 different venific and benific ‘witch’ herbs. 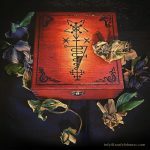 The box lid is pyrographed with the “Sigillum Major” or “Greater Sowing Seal”, which you also see used as the official logo for Teufelskunst. 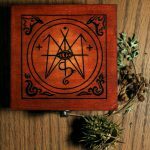 Inside is pyrographed the “Sigillum Minor” or “Lesser Sowing Seal”, which is a simplified version of the former. Each box has its number pyrographed at the bottom. The boxes are then stained blood red, sanded and varnished. Along with this, hundreds of little paper bags are labeled and filled with the seeds, which I partly gather by myself and partly purchase from other gardeners. I am step by step continuing the series and with time this work has become a tradition of its own. I spend about a month on 4-6 of these boxes. Included in this time frame is also the research on new herbs and compiling info texts. 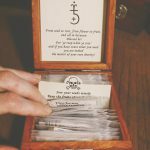 It is a tedious but also rewarding process, which gives me the chance to connect deeper with the herbs and it also empties the mind and brings new inspiration. I also learn how the seed for each herb looks and what it requires to break its dormancy. 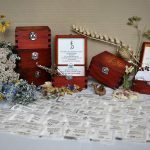 It is my hope that the content of these boxes will bring joy to others and aid them in their own studies. Printed sowing instructions in tabular form are included with each box. Extent info on each herb and its cultivation are provided on my herbal blog. Note: Please respect that these boxes are a special offer, which is available only a few times every year, usually in spring and autumn. During the time I invest into these little treasuries I put other work aside. I hence have to sell them, once finished, as fast as possible. 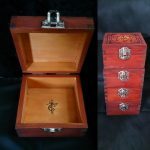 You can email me to be added to a reservation list for future boxes. If you pay in advance you can be sure to receive one of the next batch. 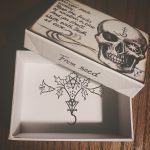 Update: As of April 25, 2017 I have sold and shipped boxes numbers 31-36. I will soon begin work on the last boxes for this season, which will be numbers 37-40. I hope to finish these in May. Boxes 31-40 include some new rare species, as well as typical summer herbs. They contain both seeds that are sown in spring or early summer and that like it warm as well as cold germinators, which can be sown in autumn or given the artificial cold treatment in the fridge.